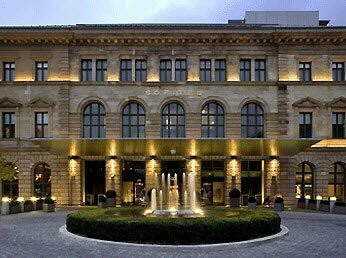 The luxury Sofitel Munich Bayerpost opened in August, 2004, a masterpiece of contemporary architecture and modern design behind the Wilhelmina facade of the former royal Bavarian post office. The luxurious accommodation provides contemporary style, comfort and elegance with 339 guest-rooms and 57 suites. Executive Chef Sascha Baum celebrates international gourmet cuisine at the stylish hotel restaurant Schwarz & Weiz . The French Sophie‘s Bistro offers daily bistro specialities fresh from the market and savoury dishes from the lava grill. The Spa Lagune with 600 sqm offers a heated Swimming pool as well as a fully-equipped fitness centre and variety of cosmetic and massage treatments. 24 hr. reception, concierge service, guest relations service, valet parking, central safety deposit at reception for larger articles, languages spoken German, English, French and Arabic.Preferred daily national/international newspapers delivered to room gratis. Doctor on call 24 hrs. The hotel’s 339 rooms and 57 suites all offer optimal comfort and a modern look and feature the following equipment: cordless telephone, voice messaging service, high speed internet connection, Wifi, latest generation flat screen television, Bose Wave channel with iPod port and NespressoTM coffee machine. Every room boasts a bathroom in natural stone which opens elegantly onto the bedroom. Guests can relax with Hermès beauty products. Rooms located on the upper floors afford views over the Bavarian Alps or the Munich roof-tops In 2009, the Sofitel Munich Bayerpost fully renovated its ten largest suites. Children between 5 to 11 pay a breakfast charge of EUR 1,00 per age. Baby cot is free charge. Extra bed for children up to the age of 11 is free of charge. Children in the age of 12 to 17, EUR 50,00 per room per night. Credit cards accepted: American Express, Diners´ Club, MasterCard, Visa. Foreign exchange available. The Schwarz & Weiz gastronomic restaurant invites guests on a taste voyage through the world's best cuisines. The restaurant’s pure and impressive architecture which stretches across three floors, stands out for its extraordinary lighting. Sascha Baum offers diners light and sophisticated dishes from traditional international gastronomy, to which he gives a modern touch. Sophie´s Bistro evokes a relaxed French bistro atmosphere, perfect for lunch. The menu of the day contains original dishes, based around seasonal, fresh produce. As well as the four or five starters, mains and desserts, it also offers specialities prepared on the lava stone grill. To season dishes to their taste, diners may choose from a selection of French mustards, salts and peppers from around the world, mayonnaises and other chutneys. In summer the terrace located in front of the bistro makes the perfect location for a break in the sunshine. To round off the day, a visit to the ISARBAR is called for. The bar, terrace and library offer a perfect setting in which to engage in friendly conversation. Classical and more original cocktails as well as the best bottles can be sampled in this luxurious setting. Every Monday, the ‘ ISARBAR’ offers a relaxing ambiance with live DJ sets, perfect for interesting meetings and sampling delicious concoctions. Over almost 1,800 square metres in total, the hotel features 20 meeting rooms, equipped with modern technology, which can be adapted to suit any occasion. A team of professionals can organise a made to measure event, whether it be a conference, board meeting, product presentation or a ceremony. Across a surface of 923 square metres, the ‘Nymphenburg’ room can welcome up to 800 people and is the largest reception room in central Munich, not supported by columns. An elevating platform as well as an innovative light and colour system permit optimum conditions for any meeting. At the heart of the hotel, an immense lobby, covered 27 metres up by a glass roof, plays host to receptions and exhibitions. A lighting system along the stairway, leading to the gallery, can carry out 44 sequences of different colours, completing the aestheticism of the venue. The meeting rooms located on the fifth floor are ideal for organising discreet meetings in a sumptuous setting. Over approximately 80 square metres, the two sound-proofed and luminous meeting rooms each have a capacity of 20 people and boast modern equipment. Participants can enjoy a bite to eat in the adjoining 150-square-metre reception room. Professionals specialised in this type of event are present to offer their services. Well experienced 'Inspired Meetings' concierges can meet many challenges, whether it be organising an international videoconference, finding rare flowers or perfecting a photo setting. Each guest will receive a tailored programme to make their experience unforgettable. SPA: Over approximately 600 square metres, the ‘Spa Lagune’ offers a veritable oasis of fullness and relaxation for body and mind. Apart from the spiral shaped and wave pools, the relaxing showers, saunas and other steam baths will allow guests to relax and awaken new energy. Sensual natural materials, luminosity and aromatic fragrances are conducive to an almost immediate sensation of relaxation. The spa offers an exclusive choice of massages for part of the body or integral massages, as well as a whole host of cosmetic treatments using products from the French brand, Decléor. FITNESS: To kick back after a long day at work or a trip into the city, guests can spend time in the fitness area with its state-of-the-art Technogym machines. If desired, they can request advice from a professional coach, ranging from a personalised programme to a performance diagnosis. For companies, tailored activity programmes are included in seminars to encourage optimal concentration. Perfectly situated in the heart of the city, close to the main railway station and within walking distance to the pedestrian zone and the famous Stachus square. The hotel garage has limited space, therefore no guaranteed reservation can be offered. For 24 hrs the rate is EUR 28,00. Since the hotel is located next to Central station, travellers have full access to public transportation. Underground or Subway are 2 stops away. Approximately price is EUR 2.30 one way. Pedestrian zone is 15 min walk away. Restaurants in walking distance can be recommended by Concierge or Guest Relations team.